I used to smoke. I wasn’t a heavy, heavy smoker, but I went through a halfpack of cigarettes a day- easy. I started smoking at about age 17 (in a classic case of peer pressure) and by the time I finally quit for good 11 years later, I had tried to stop smoking, more or less successfully, several times. What finally tipped the scales for me, and turned all my attempts into successfully stopping, was getting pregnant with my first son. As soon as I suspected I was pregnant I stopped smoking cold turkey, no questions asked. In fact, it was quite easy. What isn’t always easy however, is continuing not smoking. It took me quite a few years to make the transition from feeling like an ex-smoker to feeling like a non- smoker. It’s not as easy as it seems, and it took much longer than I would have thought. For a long time I craved the morning cigarette, then the after-dinner smoke, the last craving to go was with a glass of red wine. And I couldn’t allow myself ‘just the one’ from time to time either- before I managed to give it up for once and all, each time I relapsed into smoking by smoking ‘just one’. Becoming frugal is a lot like quitting smoking. Both are learned behaviors that replace pleasurable activities that well… aren’t that good for you. Shopping is a lot of fun, but it can reak havoc on your wallet. Learning to stop spending, for me at least, was a lot like learning to stop smoking. I had to replace my kneejerk reflexes with new, healthier behavior. No more trips to Ikea or H&M ‘just because’ or wandering over to Amazon.com to see what was on sale. 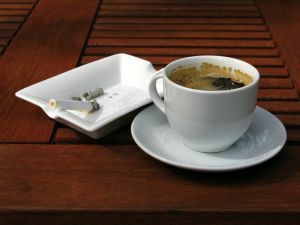 No more thinking over a problem with a cup of coffee and a smoke. And it’s hard work! I finally feel like I’ve conquered the smoking battle, but only very recently. I’m still working on the not-spending problem, and at times I feel quite down and discouraged about my lack of progress in meeting my longterm goals. If only there were a no-spending patch! And you? What battle would you compare learning to be frugal to? Oh man this is such a good analogy! As a teen I was a smoker (I know, I know, but it’s Kentucky – the land of tobacco). I think learning to be frugal is a lot like quitting smoking. For me frugality is a real battle – even though I have reigned in my personal shopping habits I still have a really hard time making and sticking to a budget. For me frugality is just part of the challenge of becoming an adult in general – being disciplined about cleaning my home, my money, my work – man, it almost makes quitting smoking seem easy! man, this is such a great metaphor! for me, learning to curb the over-spending is exactly tlike quitting smoking, and i never thought of it before this! which means this will help me have renewed motivation to keep from whipping out the credit card! robyn´s last blog post..A Sock Club For All Seasons! I think smoking is a good analogy. Also losing weight. Being frugal is a lifestyle change. It has to be your new permanent mindset. I don’t think it will work if you feel it is just a temporary period. i found it a lot like quitting smoking too. i’m still an ex-smoker and an ex-spender, though- i like how you pointed out how those are different from non-smoking and non-spending. i’m working on it. i think of stopping spending a lot like i did about weight loss. for a while , i resented the inability to buy new sweaters like i resented having to give up the extra wine, the bagel, whatever. maintaining my weight loss, i’m glad that i don’t crave cookies and ice cream any more, and am happy that i prefer to go for a run than sit on the couch and eat a bag of popcorn. i’m getting to the point where i’m able to see- and appreciate- the effects of my leaner spending habits, too. 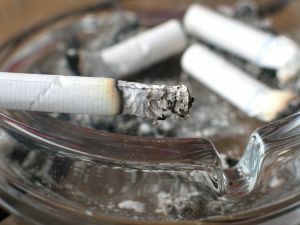 I think the thing that has really helped me to not smoke is that it’s bad for my kids. Now I need to have the same reaction with money! Becoming frugal is like dieting… it’s a process. Keep putting one foot in front of the other – then you know you are going the right direction. You need to desire progress – not perfection. Dana @ Letters to Elijah´s last blog post..Tighter Financial belt with a FIT. Nice analogy! And one that I haven’t seen before. Of course, I wish that they’d make a no-spending patch too! Great post. I quit smoking cold-turkey and stayed smoke-free for four years…and then I started again. 🙁 Although I don’t smoke nearly as much as I used to, the point is that it’s a constant struggle, and even when you quit (smoking or needlessly racking up CC debt or whatever) it doesn’t mean you should get too comfortable and assume you’ll never be in that position again. what a great analogy! I hadn’t thoght of what becoming frugal compares to, I was just trying to do it and then getting frustrated when I spend. I, too, am an ex-smoker, started way too young and it took several attempts to finally quit. Yes, there are still times when I want a cigarette, especially when stressed. Looking at spending as a bad habit that will take time to change helps me give myself some patience to get there. Thanks for this post and your blog! wow, thanks for sharing! my boyfriend is trying to quit smoking after about ten years — and it’s very tough. I really appreciate the personal insight. Oh! I’d take that no-spending patch. Especially if it could be discreetly applied to my husband’s back without him noticing! Great post! I agree completely. I think I am still in the beginning stages of trying to learn new behaviors that I can substitute for shopping. It really is all about consciousness and choices. I don’t know about others, but once I experienced the surge in my bank balance from not spending money left and right, I don’t feel like going back. Also, after months of spending little cash, I have lost the habit of shopping. I am actually buying only stuff I need for the most part, and I have to tell you, if I’m a typical first world citizen, there is very little in the way of material objects I *need* at this point. It’s gotten to the point where my bank won’t give me the 3% interest on my checking account balance because I need to use my debit card 12 times in the month to qualify, and I only shop maybe 6 times in the month! 4 times for groceries, 2 times more for maybe gas and another food shopping trip due to lack of planning. Literally, money only comes out of my pocket on 6 or so occasions a month, if you con’t count billpaying. While most people probably won’t get down to this level of skinflintery, I think a lot of people will break some of their spending habits due to the necessities of the day, and take a long time to pick them back up again because they will find other things to do with their time than shopping. that’s my two cents’ worth! Thanks for a GREAT post!!! I loved the analogy!!! While I have never been a smoker so cannot relate on that level, I am a recovering "boredom/stress" shopper (shopping with 5 kids 7 and under just adds more stress – LOL!). My biggest struggle on the quest to greater frugality is to have avoid the "crutch" of fast food! I know that it is bad for our physical and financial health, but the convenience is just too, well, convenient! Meal planning has been hard for me (although I keep trying), plus, I think I have an addiction to french fries and pizza! Thanks again for the post!! It is another great way to look at the journey to frugal living!! Being frugal sometimes becomes an addiction for me- then I feel bad spending money on something that we really need. I agree with the quitting smoking analogy- I quit cold turkey 2 years ago and still have days when I miss smoking. Same thing with being frugal- I have been doing really good but have been “leaking” money all this month on Christmas. It takes a lot of consious thought to change old patterns of behavior. @ Renee:It’s easy to “leak” money at Christmas. What has helped me is to pull out a budget category for Xmas in December and allocate a given amount to it, money that I already have in cash and which is not allocated to any other necessary spending category. Now that I have a ceiling for my spending, I can keep it at that level. Without the ceiling, I would have dribbled Xmas spending all over the place and spent 3 times the cash. RE: being reluctant to spend any cash, even on needs : I do make a point of spending money gladly when it is an actual need. On all my spending, I have been applying a two stage decision model or dialogue: 1) If it’s a need, I buy it, no questions asked. 2) If it’s not a need, then I ask (2) if I’m on track or have met my important long term goals. If I have, then I’ll consider buying a “want”. If I haven’t met those goals, or am not on track to meet them, I don”t spend on a “want” . Having decided ahead of time to apply this set of criteria to my spending decisions, I’ve found that it works. The only other category I will spend on even though my savings or long term goals are not on track is a true investment: something that returns money to me either by efficiency gains, increased income, or creates an opportunity to develop income (like starting a business for example): if it is a true opportunity that I estimate will return my investment back plus principle, then I will put cash down on it. Of course, that’s because this category is actually an investment that would contribute to my long term goals. If ever there was a true statement! I feel like I'm slowly moving over to a non-spender. It's easier and easier not to spend. I even find when I am in stores I am very hesitant to actually buy anything, there's now this internal dialogue that forces me to weigh all opportunity costs involved with every purchase. In fact, this automatic thought process makes me avoid shops all together because it's so much mental effort to be in one! LOL! I'm still worried about relapsing though, I am very close to being debt -free again (my last relapse brought me $4000 in CC debt to attend my brother's wedding on the other side of the world). It made me realize that better future planning is required to remove temptation to us the CC as a crutch.